Want free Windows 7 Ultimate? Get on the Bus! If you have been wanting to get a Windows 7 Ultimate but don’t have a dough for it, well your prayers have been answered. 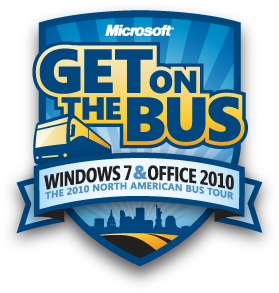 As part of its advertising campaign called “Get on the Bus – the tour” is back and driving through 10 East coast cities where Microsoft would talk of its brand new products, Windows 7 and Office 2010. You would have to register for free on their website. As part of the campaign Microsoft is giving away free Windows 7 Ultimate and Office 2010 software. To get your free copy of Windows 7 Ultimate and Office 2010 you have to be the one of the first 50 to enter the bus at every stop. Only US residents and Canadians who are 18+ are eligible. What’s with 18+ for a software cd? The tour stars at Montreal en route to TechEd in New Orleans on June 7th. The tour group consists of top 10 experts including senior Windows and Office team members. The following is a summary of dates. Windows getting Kinect on Feb 1st! Previous HP Slate & Microsoft Courier out of the game.